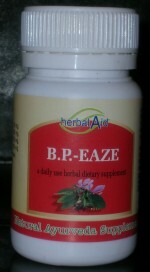 PRODUCT DESCRIPTION: A blood pressure of 140/90 mmHg or higher is considered high blood pressure. Both numbers are important. If one or both numbers are usually high, you have high blood pressure (hypertension). According to recent estimates, nearly one in three adults has high blood pressure, but because there are no symptoms, nearly one-third of these people don’t know they have it. In fact, many people have high blood pressure for years without knowing it. Uncontrolled high blood pressure can lead to stroke, heart attack, heart failure or kidney failure. This is why high blood pressure is often called the “silent killer.” The only way to tell if you have high blood pressure is to have your blood pressure checked. B.P. Eaze treats hypertension by balancing and regulating blood pressure and it also addresses some of the contributory factors which may be causing it. While some of the ingredients in B.P. Eaze specifically target blood vessels which have become constricted, others improve the heart’s ability to pump blood effectively, while also treating and preventing plaque build up in the arteries. B.P. Eaze also helps to reduce stress and boost the body’s ability to fight illness. DIETARY ADVICE : Calcium becomes a potent assistant to decrease blood pressure due to diuretic properties that help the kidneys release sodium and water, causing some experts to suggest that some forms of high blood pressure may be due to calcium deficiency rather than surplus sodium. Sources include dairy products (make low fat choices), green leafy vegetables, broccoli, collard and turnip greens, and kale, as well as canned salmon and sardines with bones, firm tofu, dried figs and chickpeas. Eat plenty of fruits and vegetables, such as apples, asparagus, bananas, string beans, blackberries, cabbage, cantaloupe, carrot, eggplant, garlic, grapefruit, melons, onions, peas, prunes, raisins, raspberries, tomatoes, squash, and sweet potatoes. Include fresh “live” juices in the diet. The following juices are healthful: beet, carrot and celery, currant, cranberry, citrus fruit, parsley, spinach, and watermelon. Eat grains like brown rice and oats.